Maine’s bear population has been growing steadily over the past decade or two. In 2000, Maine’s Department of Inland Fisheries and Wildlife (DIFW) estimated the bear population at 23,000 – it is now estimated at 30,000. Our current yearly harvests of about 3,000 bears, annually removes about 10% of the population. Our bears have additional losses to other mortality factors, but these are likely far less than hunting losses. At this time Maine bears are productive, with twin and triplet litters being the norm. Addition of young bears into the population has been more than adequate to offset losses to hunting and natural factors. If Question 1 passes and bear harvests plummet well below the 3,000 mark, Maine’s bear population will increase at a rapid pace. Based on current population demography, it could double over the next decade, unless their natural carrying capacity is exceeded first. No animal population grows indefinitely. Eventually, the population exceeds its natural food supply. In the wild, most high quality foods, whether of plant or animal origin, tend to be scarce. As a population grows, competition becomes fierce for the high quality foods. These are taken by the largest, most aggressive individuals; subordinate individuals are left with the lesser quality foods, if any. In populations that have reached or exceeded its food supply, body condition declines in most individuals, due to malnutrition. Reproductive rates drop, as females are less able to support pregnancy and/or lactation. Populations at full carrying capacity tend to be made up of older individuals, due to low production and survival of young. Stress and competition for food can lead to high injury rates, and cannibalism among predators. Diseases related to poor nutrition, as well as infectious diseases, increase among over-abundant animal populations. Among species capable of long-distance movements, like bears, hunger increases dispersal away from over-populated areas toward more food-rich environments. Desperation for food can minimize an animal’s natural fear of man. Animal populations that have reached or exceeded the carrying capacity of the land sometimes damage vegetation or diminish their prey populations. 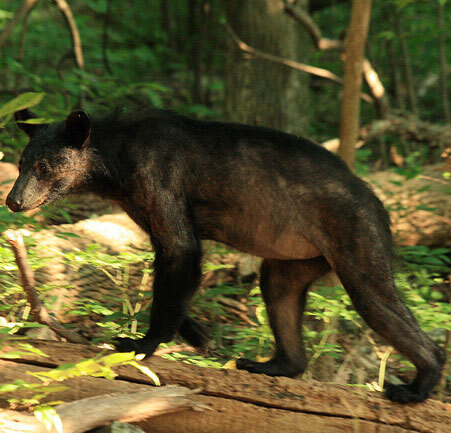 Bear populations can be self-regulated in the absence of hunting. But such populations usually stabilize at high densities, near the limit of the carrying capacities. Self-regulated populations exist in a state of chronic malnutrition and disease. Annual mortality is focused on the young, through low birth rates, poor survival through age 3 or 4, fighting injury, and commonplace cannibalism by adult males. Deliberately maintaining a population at the limits of its food supply is cruel for the animals, and is often problematic for the landowners who must co-exist with that species. No one can be certain when Maine’s bear population will exceed its natural food supply, if Question 1 passes. But we can be certain that it will occur, if chronic under-harvest develops. In the short term, we can expect the bear population to become more numerous, and possibly more visible. Age structure will gradually shift to larger and older bears. When bears are too numerous they exist in a chronic state of starvation. As the body digests itself the bears become emaciated like this one, suffering hair and tooth loss, disease, exposure, and finally organ and renal failure. Naaman Pratt photo. 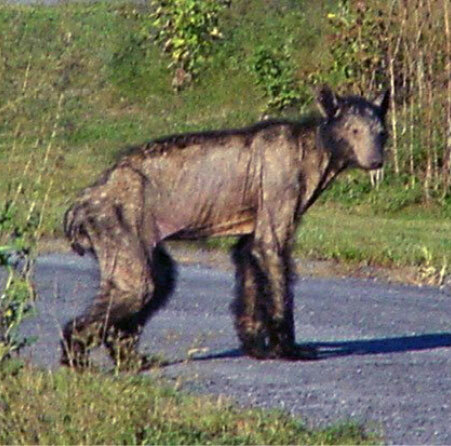 A bear with mange, a small mite that burrows in the skin, defecating in the tunnels it makes, and causing itching so severe the animal scratches its hair off. Mange is progressive and usually leads to death by starvation and exposure. This bear weighed 100 lbs., but according to its frame should have been about 300 lbs. All parasites are aided by high population densities of their hosts. Mange will become more common in Maine bears as their numbers increase without control. MDIFW photo. When chronic food shortages emerge, expect our bears to decline in physical condition, particularly among bears less than 4 years old. Expect to see fewer cubs afield, as reproductive rates diminish. And expect to encounter hungry bears unafraid of humans more frequently.